The greatest lesson that I have learned in my first semester of seminary formation is that distance from God is the heart of all struggles. This fact that God is the source of all good things in my life has been very influential and motivational in the development and deepening of my prayer life in the seminary. Over the past five months, I have truly placed God at the center of my life. I now consciously bring God into every aspect of my day to day activities. My goal every day is to make sure that I am aware of the fact that God is the reason I am doing whatever it is that I may be doing. Even down to the simplest of actions such as washing my hands, I work and strive to recognize God in this action. Making God the absolute center of one’s life enables one to be truly happy. This is what I have experienced through this first semester of seminary formation, true happiness in God through a closeness to Him. Since having made that awareness of God in every aspect of life my priority, the senses of peace and joy, which I already had in the seminary, have greatly increased. True peace and joy can only be found in Him, and this is the best thing that I have discovered so far in seminary. Reflecting in prayer on all of the problems in the world, specifically the current crisis in the Church, I now realize that the cause of these problems is a lack of acknowledging God and a lack of prioritizing Him. The horrible sins committed by those whom we trust and look up to in the Church are not a result of the lack of God’s presence in the world, because He is truly ever present, but instead, the cause of these sins lies with some of His children not being conscious of His presence. The priests and other clergy members who committed these horrible acts did not truly have God at the center of their lives; they did not consciously bring Him into everything that they did. Without consciously having God with us in all things, we end up seeking peace and joy in other things. 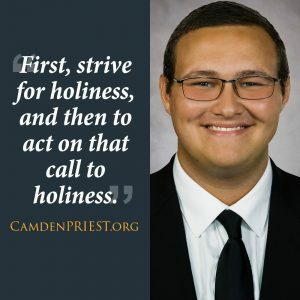 We all need to strive for holiness which we work towards through making God the priority of our lives and through acknowledging Him in all that we do. This has been a great inspiration for me as a seminarian and more so, simply as a Catholic; to first, strive for holiness, and then to act on that call to holiness. I have learned that acting on this call to holiness is done through consciously bringing God into everything that I do. There is only one outcome of having God at the center of your life and of doing all things in, with, and for Him, and that outcome is true peace and true joy. Even though we all will inevitably go through dark times of struggle and suffering, where we may not be able to see the light, with God at the center of our lives, goodness will come of what seems to be difficult in the moment. God shines His light in our darkness and brings us out of that darkness into His light. Christ Himself had to struggle and suffer, but as He suffered for God and with God, His sacrifice bore for us redemption from sin. This is true for all of us, that in suffering and sacrificing in, with, and for God, we too will bear fruit. One of my favorite expressions that I have heard this semester is that “there is no Easter Sunday without a Good Friday.” This expression tells me that we cannot experience joy and peace without God, even if that means that we have to suffer to get there. During this Good Friday that the Church is going through, I pray that we all might bring God into our suffering, recognizing that we are suffering in, with, and for Him, that we all might place our trust in Him, and that we all work to allow Him to shine His light in this time of great darkness. Nickolas Naticcione attends The College Seminary of the Immaculate Conception at St. Andrew’s Hall, Seton Hall University in South Orange, NJ.